Thermaltake, being the industry pioneer brand in thermal solutions, carrying the corporate vision of “building Thermaltake Technology into a cultural brand for the enjoyment of entertainment, e-Sports, technology, and lifestyle” and continues to drive toward the corporate mission of “delivering the perfect user experience” for all man kinds. Beginning of this year Thermaltake has sent the Chaser MK-I with air cooling system (ACS) out on a mission into the universe for all e-Sports enthusiasts to counteract all heat issues. This Fall, the new Chaser MK-I returned to the base with its indestructible form and dynamic appearance which is ready to be equipped with an alternative thermal solution - the liquid cooling system (LCS) and be transformed into the new Chaser MK-I LCS to serve a greater good for the most discerning PC gaming purists. Since the last creation of chassis with built in liquid cooling system. 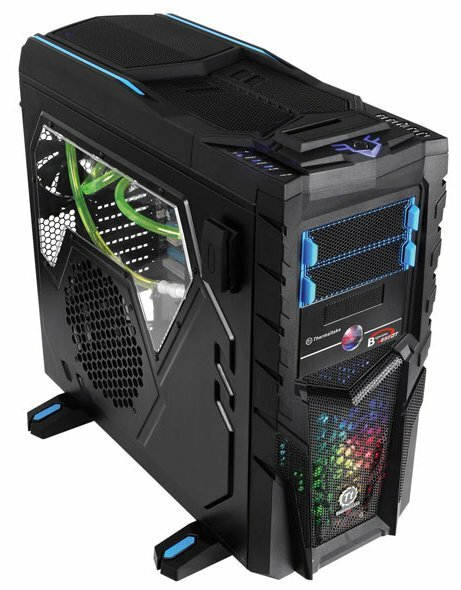 The integrated LCS has slowly revived in the universe therefore this fall Thermaltake offers all e-Sports enthusiasts with the new Chaser MK-I LCS, a full-tower with integrated LCS. The integrated LCS is the new generation drive bay liquid cooling system, consisting of an all inclusive drive bay unit and intelligent interconnecting waterblock with the robust material non-spill quick connectors offers an effortless installation. The slim waterblock was developed with pure copper base that maximizes the thermal efficiency. Also, with dual 120mm fans and the 240mm Dimple Tube Technology radiator increases the turbulence within the radiator to perform maximum cooling action. In addition, the P500 pump pushes 500L/H of water to improve the overall cooling efficiency and performance level. Furthermore, the ultra quiet pump, 12cm blue LED fan, water reservoir are all preinstalled inside the drive bay unit to achieve maximum performance for another grand Thermaltake mission. With the integration of LCS, the Chaser MK-I LCS still kept its fierce e-Sports appearance and incredible functionality, like the amazing breath light effect, the internal Superspeed USB 3.0, top-mounted HDD docking station, innovative 5.25” &3.5” tool-free device with HDD anti-vibration mechanism, combat headset holder, heighten footstand to enhance the airflow, dual colorshift front intake fans, smart cable management and large interior space which support up to a 18cm CPU cooler with 3-ways SLI/ATI Crossfire VGA cards that could be up to 33cm long. With the newly equipped LCS and stimulating functions, the Chaser MK-I LCS is ready to take another journey into the universe for Thermaltake to serve all e-Sports enthusiasts needs.